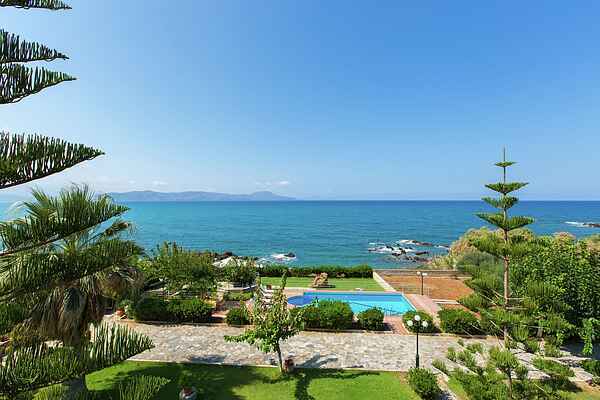 Villa Katerina is ideal for large families or groups. It sleeps up to 15 people in 7 bedrooms and 5 bathrooms arranged over two floors. The downstairs floor of the Villa has 3 separate appartments all with their own sitting/dining area, double bedroom, kitchenette, sofa bed, bathroom and terrace. The villa on the first floor features a large living space, a fully equipped kitchen, all modern amenities you can think of and 5-star-view balconies all around. The villa is located next to the beach and sea. On the outside, 5 acres of land with trees and flowers, plenty of relaxing space, a 50 square meter swimming pool with sunbeds and umbrellas, as well as BBQ and dining facilities, guarantee peaceful and magical days and nights. Villa Katerina is located in the broader area of Petres, just a few minutes outside Rethymno City (by car). The area is named after the Gorge of Petres, a natural attraction and a very important water resource. The beach of Petres is sandy and clean. It connects with the famous beach of Episkopi to create a huge seafront that goes for miles.